This is my interpretation of Betty Crocker’s version of a turkey cupcake. These gobblers would be a great addition to the Thanksgiving table. What You Need: 1 cupcake; chocolate frosting; candy corn; chocolate sprinkles; candy eyes (or just use mini M&Ms or other small candy); decorating bag, couplers and #12 Metal tip. How to Make It: Frost cupcake. Assemble piping bag. Squeeze medium-sized blob onto center of cupcake, holding tip in one position so the frosting “pools” rather than building up very high. Then make a separate flattish blob on top of that one. Stick candy corn toward back of cupcake and on top blob for nose. Add eyes. Spinkle near tail and top of head. 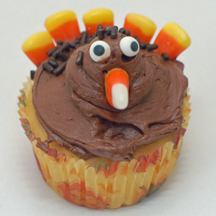 This entry was posted on Wednesday, November 19th, 2008 at 4:04 pm	and is filed under Thanksgiving cupcakes. You can follow any responses to this entry through the RSS 2.0 feed. Responses are currently closed, but you can trackback from your own site.